While home remedy bed bug treatment options can sometimes be effective, the single most effective way to get rid of bed bugs is to get professional help. In many cases this involves use of strong pesticides, although a number of exterminators are beginning to use environmentally safe options such as steam and heat treatments. If you're against pesticide use, and want to try other options, below are a few options you can try. These options have worked for some people and may be effective for you as well, especially when combined together. The bed bug vacuum can be a highly effective tool for removing bed bugs, especially when they can be seen. A vacuum should not be used as the only bed bug treatment strategy. Vacuuming combined with Steam (discussed below) and other treatment options can be highly effective. Use a high powered vacuum with plenty of suction. A bed bug vacuum is recommended. Utilize the various accessories to get into small areas and completely vacuum surface areas. Use a HEPA bag to make sure all particles and bugs are caught. Immediately after vacuuming, dispose of the vacuum bag in a sealed plastic trash bag. Do not vacuum bed bug eggs, they are sticky and will just get caught up in the vacuum cleaner and cause your vacuum to become infested. Bed bugs do not like heat and die quickly at any temperature exceeding 115F degrees. The problem with heat, especially on a large surface such as a bed is getting the heat into the bed where the bed bugs are hiding. That's where steam comes in. Steam can penetrate mattress and box spring cloth and get into locations where bed bugs are hiding, and kill them. Steam is also very effective at killing bed bug eggs as well. For the home remedy person, steam is a great option because steam is chemical free. Normal steamers will not work, as they do not produce a continuous amount of steam at the proper temperature. A steamer designed to treat and kill bed bugs must be used. A number of quality bed bug steamers are available. The Vapamore MR-100 is budget priced and receives top reviews from consumers. Be sure that the steamer is in full contact with the surface being treated to insure optimal steam penetration. Check the streamer frequently to be sure steam is still being produced. If not, get the steamer working again, and return to the last place where you knew the steamer was working, and start again. Failure to do this could result in bed bugs or bed bug eggs getting missed, making your attempt futile. Make sure you purchase a steamer with a high PSI, so the steam goes far into the item being steamed. Use the various attachements that come with your steamer to optimize treatment. Be very careful to not miss a single area. Missing an area can result in the return of the bed bugs you thought you killed. Natural insecticides like Pyrethrin can kill bugs on contact. While not as effective as chemical based pesticides, they can work. Pyrethrin is available online from a number of different sources. Rotenone has also proven to be a very effective natural insecticide for killing bed bugs. The main problem with natural insecticides like Pyrethrin and Rotenone is that they generally don't kill on contact and if adequate amounts are not used, they will just drive the insects into other areas rather than killing them. If you do elect to use natural insecticides, make sure you use strong enough doses and completely cover the treatment area and surrounding areas. Diatomaceous earth is a natural and "green" method of killing bed bugs, but there are some pros and cons you should be aware of. In general, it is considered a very effective treatment option, especially when combined with heat treatment or steam treatment. Diatomaceous Earth works by puncturing the bed bugs outer shell, which causes the bed bugs to dry up, and die. We have a entire guide to using diatomaceous earth on bed bugs. In areas were temperatures in the sun can exceed 115 degrees, the sun can be used to kill bed bugs. For hot climates that don't exceed 115 degrees, you can often wrap items, including large mattresses and box springs in plastic wrap and set the items in direct sunlight. Due to the plastic, temperatures inside can significantly increase and exceed 115 degrees, killing any bed bugs. Any items should be exposed to heat exceed 115 degrees for at least an hour. There are also a number of commercially available products that will heat up items from your home to kill bed bugs. You can read more about bed bug heat treatment, in our Heat Treatment Guide. Placing these covers on your mattress and box springs trap the beg bugs inside your mattress and keep them from being able to feed. Without blood to feed on, they will die. Encasing your mattress and box spring, is the #1 most effective step you can take to elminating both bed bugs and bed bug bites in your home. Fortunately, it's also one of the least expensive steps as well. Using standard mattress covers are not enough and certified bed bug covers should be used. 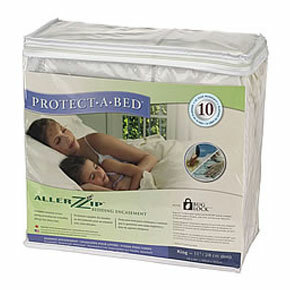 Bed bug mattress covers have a unique zipper design that keeps bed bugs from escaping the zipper opening. Also, using bed bug covers for treatment alone is not enough. Bed bugs can be on the frames, in the carpet, in sheets, and on surrounding furniture. Bed bug and box spring covers should be used along with other treatments like vacuuming, steaming and diatomaceous earth. Essential Oils are incredibly popular, and used for numerous home remedies, in addition to just making your home smell nice. Whether essentials oils are effective on bed bugs or not, has not been scientfically proven, but many claim they work, and work well, especially Lavender Oils. While we think other natural options are far more effective, if using essential oils to treat you bed bug infestation is of interest to you, be sure to read our guide on Essential Oils.